The October 30 release of Luis Miguel's VIVO on DVD and video, marks the first simultaneous release of a Spanish language concert video on pal/ntsc and DVD in Europe, the U.S. and South America. Produced by Luis Miguel and directed by award-winning director David Mallet (U2, Madonna), VIVO is a full concert from Luis Miguel's record breaking tour in support of his AMARTE ES UN PLACER cd, which won Album of the Year, Pop Album of the Year and Best Pop Vocal Performance at the first Latin Grammys, last month. Released on Warner Vision in Europe, WEA Latina in the U.S. and Warner Music International in the rest of the world, VIVO is the also the first official DVD music video release designed specifically for Region 4. It is the only Spanish language music DVD to be released outside of Spain and South America. Heretofore, the majority of DVD product sold in Latin America came from the U.S. and were compatible with U.S. DVD players. The penetration of Region 4 players into the Latin American market has increased to the point where Warners is now creating Region 4 product for the Region 4 players. "Luis Miguel's tremendous popularity worldwide makes him the ideal candidate to release a DVD in Europe, the U.S. and South America," says Maribel Schumacher, Warner Music Latin America's Vice President of Marketing. "On this DVD, fans will be able to experience the world class production values and first rate musical content that have made him one of world's top-grossing live performers." Warner Vision has been on the forefront of DVD releases since l998 when it became the first company to release music on DVD. VIVO is one of 50 DVD videos scheduled for release this year by Warners. 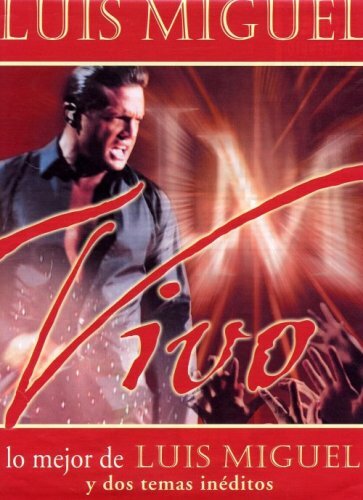 The DVD and the ntsc/pal videos are packaged in a special red foil stamped package similar to the packaging for Luis Miguel's VIVO CD, which was released on October 3rd. VIVO on DVD includes more than 91 minutes of material, 30 more than the CD and was filmed during a five night, sold-out string of dates in April 2000, at Mexico's famed Fundidora Stadium in the city of Monterrey. The AMARTE ES UN PLACER kicked-off in September 1999 in Spain, and by the time the tour ended seven months later, Luis Miguel had played over 99 concerts in eight countries. VIVO includes hit tracks from AMARTE ES UN PLACER. It also includes medleys from his Grammy winning trilogy of bolero albums, (1991's ROMANCE, 1994's SEGUNDO ROMANCE and 1997's ROMANCES) and favorite songs such as "Suave", "Como Es Posible Que A Mi Lado" and "Te Propongo Esta Noche". Fans are also treated to Luis Miguel's soaring performance of two traditional songs with full Mariachi, "Y" and "La Bikina", which were only performed on the Mexican tour dates. VIVO is a great opportunity to appreciate Luis Miguel's showmanship. It's a first hand experience of the elegant yet simple staging replete with big screen video and fireworks, the gorgeous horns and driving guitars of his l3-piece band and most of all, the soul-barring vocal performance of superstar Luis Miguel. Performer/songwriter/producer Luis Miguel is one of the most charismatic performers in all of pop music (visit www.dbaronmedia.com/news/luisvivo.html), and has sold more than 45 million records worldwide. The Mexican heartthrob Luis Miguel started singing at the age of l0, recorded his first record at 12 and won his first of seven Grammy at 15. He mastered the musical nuances of pop, bolero and mariachi music to become the most celebrated singer in the world "with the power to make young women melt like butter and old women swoon like teenagers", said one critic. 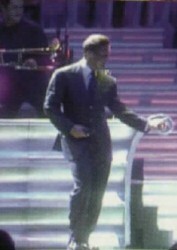 Luis Miguel was the first Latin artist ever to be included in Pollstar's Top 20 All-Time Grossing list of artists who have sold the most tickets at any single U.S. venue; he was the first foreign artist recording in his own language to be recognized by the RIAA for selling double platinum; he was honored with a Star on Hollywood Walk of Fame; his ROMANCES CD, was the first Spanish-language album to debut at #14 on the Billboard Top 200 Album charts. "Spanish is a beautiful language," says Luis Miguel. "Spanish can express "I love you" in so many ways. Onstage, I need to believe what I am saying and to feel that the audience is really feeling what I am singing." Indeed, on VIVO Luis Miguel makes Spanish truly a universal language, because there is no mistaking what this artist is communicating: He is one of the most accomplished and universally loved performers in the world.